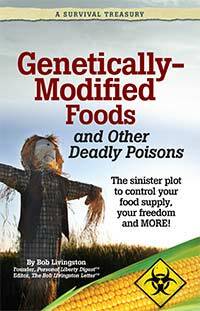 It’s a fact: The FDA covered up 40,000 documents showing GMOs to be toxic. And science says they increase your chances of dangerous cancers! But they’re not your only concern. The U.S Environmental Protection Agency reports there are over 84,000 different chemicals dumped, leaked, and floating around in your house... at your workplace... in the ground where your food grows... and in the air your breathe! The truth about “Frankenfoods” — GMOs — and what you’re really eating! How to choose cookware that doesn’t cook up a toxic soup of dangerous chemicals every meal! How to tell if your skincare, makeup and beauty products are REALLY safe! The one chemical you need to make sure is not in your personal care products! The radioactive metal that could be living in your water! Plants that pull poison from the air!